Summer in Chicago means street festivals, Cubs games, and looking out your office window and thinking, “I need to get the hell out of the city, right now.” But before you decide to pack up and make yet another trip up to Wisconsin or Michigan, turn your sights inward and focus on all the overlooked small-town charm located here in the Land of Lincoln. These are the best places in Illinois for a weekend vacation, and all the things you should do while you’re there. 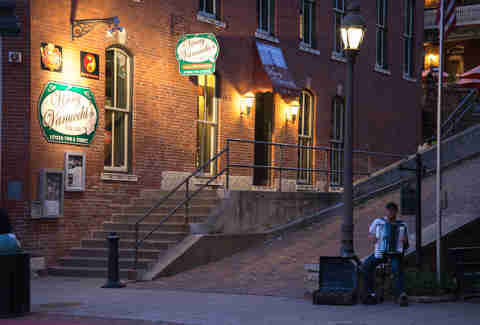 Why it’s so great: Galena’s charm makes it the best small town in Illinois all year round, but it’s especially great in summer, when you can ride the free trolley to go bar- and restaurant-hopping down the quaint Main Street. Plus, there’s a bunch of fun activities to be found along the Galena River, such as kayak and canoe rentals and riverboat cruises. 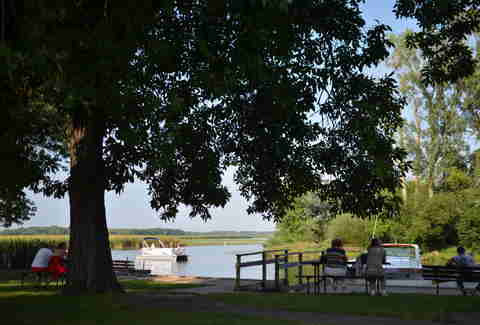 Or just pick up some vino from one of three area wineries and spread out a blanket along the scenic Galena River Trail. Where to eat and drink: If you’re lucky enough to be here on the Fourth of July, grab burgers and brats while chatting up friendly locals at the annual rooftop party atop the historic DeSoto House, the oldest hotel in Illinois. The Goldmoor Inn, perched high on a bluff overlooking the Mississippi, is never a bad idea for romantic fine dining, and Vinny Vanucchi’s downtown is a fun locals spot for casual Italian. 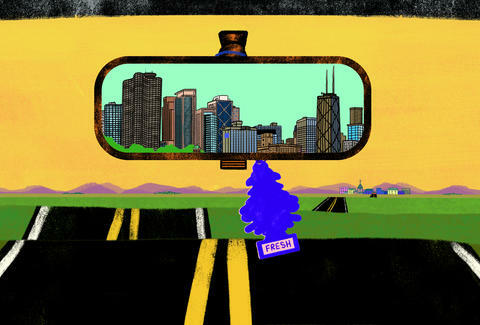 Why it’s so great: Located only an hour west of the city via a traffic-free Metra ride, Geneva is technically a suburb of Chicago but sure as hell doesn’t feel like one. One peaceful stroll around the downtown bar and restaurant district along Third St will have you looking up local real estate prices. Throw in a visit to Geneva’s serene Island Park along the Fox River or a minor league baseball game at the Kane County Cougars stadium and you’ve got a pretty awesome weekend on your hands. Where to eat/drink: Beloved taco shop Bien Trucha is one of the best restaurants in the state, Fiora’s downtown can always be counted on for a romantic meal and fun time (hopefully with some live music), and the outdoor patio at Salerno’s on the Fox in nearby St. Charles is the perfect place to watch the boats pass along the river while downing a few brews. Why it’s so great: Home of the underrated party school of Southern Illinois University, this equally underrated town can be counted on for more than just a rowdy good time and Halloween riots from the old days. 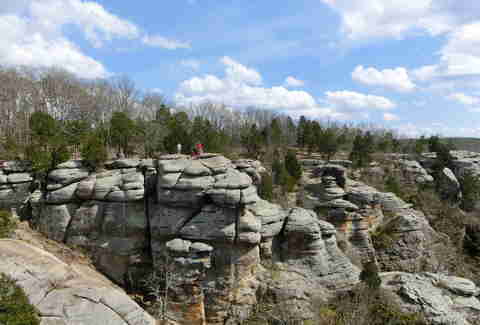 While the unapologetically fun college bar scene and local dives like PKs demand at least one visit, the real draw of this college town is its sheer abundance of natural beauty, with 14 stunning parks surrounding it, including the sprawling Shawnee National Forest, the largest public land in the state. Better pack a Frisbee. Where to eat/drink: Quatro’s is slinging one of the best pizzas in the state, and 17th Street BBQ in Murphysboro, one of the finest BBQ joints in the nation, is just 15 minutes away. Then there’s the beautiful Shawnee Hills Wine Trail, winding its way through 12 vineyards south of town. Find a responsible driver and get to it. Why it’s so great: “The New England of the Midwest” is the slogan of this beautiful little town, known for historic sites like the Carroll County Courthouse (in continuous use since 1858) and the Nathaniel Halderman House, built in 1854 as the home of the town’s first mayor. 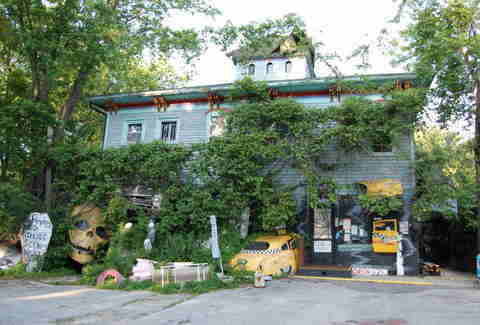 Rent a lakeside cabin at Timber Lake Resort, check out the oldest summer theater in the state at the Timber Lake Playhouse but, whatever you do, don’t skip town without visiting the delightfully weird Raven’s Grin Inn -- a year-round haunted house we deemed the most bizarre building the state. Why it’s so great: Following the Mississippi along the western edge of the state, the Great River Road is one of the most scenic drives in the Midwest that you had no idea existed. 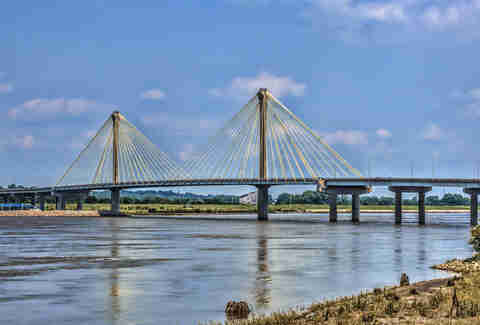 The road also passes through cool historic towns like Alton -- birthplace of Miles Davis, home of the Historic Museum of Torture Devices, the gorgeous riverfront amphitheatre, and site of the Lincoln/Douglas debate. Despite the preponderance of Cardinals fans in the area, nearby towns like Grafton -- home of a floating winery in a marina they call “The Key West of the Midwest” -- help make the region a more than worthy weekend destination. Where to eat/drink: With 99-cent bratwurst, 29-cent shrimp, and 4,000 half-barrels of beer, Fast Eddie’s Bon-Air, built by Anheuser-Busch in 1921, is known for its marinated tenderloin delight known as the Big Elwood on a Stick (don’t ask, just order it). Old Bakery Beer and Bluff City Grill are also solid local hangs. 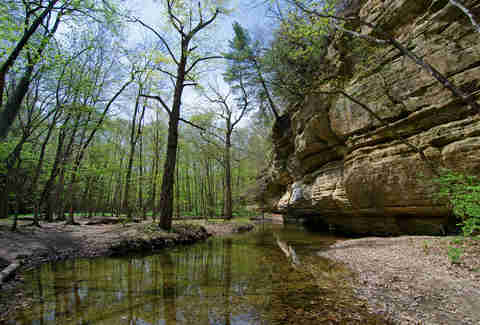 Why it’s so great: Taken together with nearby Peru, Utica, and Ottawa, the Illinois Valley is most famous as the home of Starved Rock State Park, where you can go chasing waterfalls amidst the gorgeous bluffs and canyons or take mule-pulled boat rides along the I&M Canal. But it’s not just nature and historic mansions that these old-school towns are known for, it’s also booze -- with one of the highest concentrations of bars per capita in the country that help make the area an iconic drinking destination. Where to eat/drink: You’re going to want to wet your whistle at local watering holes like Duffy’s Tavern in Utica before kicking back with a beer and plate of cheese curds on the lively outdoor patio at riverside hang Water Street Pub in Peru. But you’ll want to spend most of your time seeing live bands, eating pulled pork, and gawking at the views on the Starved Rock Lodge’s terrific Back Door Lounge deck. Why it’s so great: Minnesota may be the land of 10,000 lakes, but the Chain O’Lakes near the Wisconsin-Illinois border showcases its own network of 15 interconnected bodies of water with fishing, hiking, and horseback riding. Rent boats and horses (hopefully not at the same time), reel in some fresh walleye and largemouth bass, or just sit back and soak up the sun. Where to eat/drink: You can’t visit the region without making a trip to the notorious Blarney Island bar, famous for its Thursday night boat races and all manner of ridiculous summer events, including an EDM fest and a body painting party. Whistle Stop Café and Carlos’s Mexican Grill are restaurant favorites for the locals. Why it’s so great: Don’t expect a Portlandia-style hipster haven in this tranquil town of 3,700 situated on the banks of the Rock River. 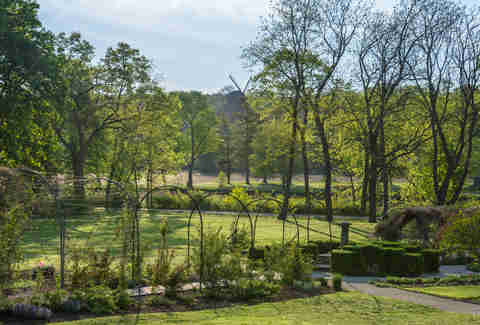 If you really want to get away from it all, this nature hideaway has been serving as an artist’s escape from Chicago since 1898 when the modern-day Lorado Taft Field Campus was built alongside its iconic 50ft Black Hawk Statue overlooking the town’s rolling hills and rocky bluffs. 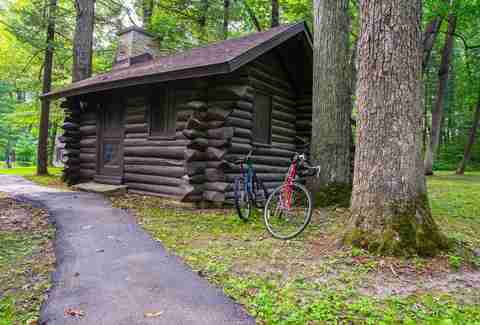 Nearby Castle Rock State Park is an underrated gem for canoeing and hiking but if you’re tired of roughing it, grab a spa treatment at White Pines Forest State Park’s White Pines Inn -- the only state park we know of with an on-site masseuse. What to eat/drink: This tiny town punches well above its weight where food is concerned, with a large array of restaurants from laid-back Northern Italian at La Vigna to expertly cooked meats over an open flame at The Blackhawk Steak Pit to a full-on retro experience at Jay’s Drive-In. Jay Gentile is a Thrillist contributor and now he has that damned song by John Cougar Mellencamp about small towns stuck in his head. Follow @innerviewmag.